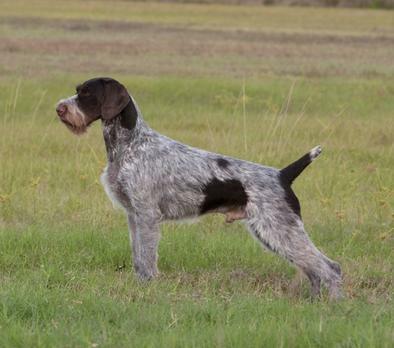 Willamette German Wirehaired Pointers - Int'l CH GCH Willamette's Lookout Ready Aim Fire JH "Riddick"
Int'l CH GCH Willamette's Lookout Ready Aim Fire JH "Riddick"
"Riddick" is a gorgous boy wiith a correct coat, structure and great temperment. He has natural ability and easy to train. Riddick finished quickly in the ring at 9 months with 3 majors and a Best of Breed win over a Special then completed his Grand Championship shortly after.